Central sleep apnoea (CSA) occurs in a large proportion of HF patients. CSA has clear detrimental effects, resulting in intermittent hypoxia and sympathetic activation, and is associated with significant morbidity and mortality. Treatment options are limited following the results of a recent trial in which adaptive servo-ventilation resulted in an increase in cardiovascular mortality. Ongoing studies utilising other forms of positive airway pressure may provide additional insight into the results of this trial. A new neurostimulation therapy, phrenic nerve stimulation, has offered a new physiological approach to the treatment of CSA. This therapy has resulted in improvements in the severity of disease and quality of life. WA is a consultant to Respicardia (manufacturer of the phrenic nerve stimulation device discussed); RG is Chief Medical Officer of Respicardia; AP has no conflicts to disclose. 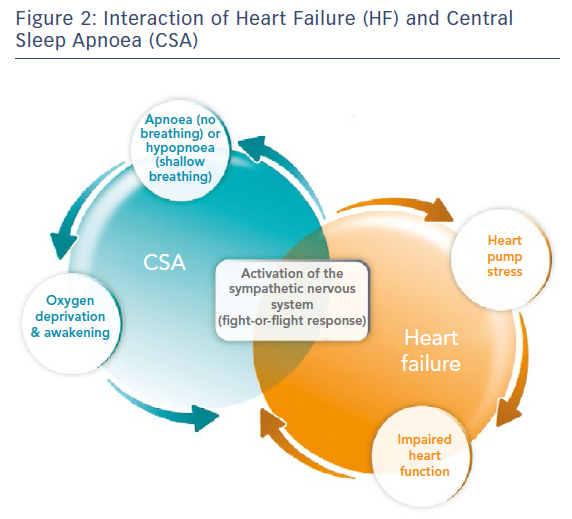 Central sleep apnoea (CSA) occurs in approximately one-third of patients with HF and is associated with a significant increase in morbidity and mortality compared to HF patients without CSA.1–3 CSA results in intermittent hypoxia and activation of the renin–angiotensin system, which contributes to worsening HF.4 Symptoms such as fatigue and difficulty concentrating often overlap with the effects of chronic HF. Treatment options are limited. Positive airway pressure (PAP) therapy has been the most commonly utilised but has failed to demonstrate improvements in quality of life (QOL) or HF.5,6 In addition, one form of PAP therapy increased mortality as a secondary endpoint in patients with reduced ejection fraction.6 A recently approved therapy has taken a physiological approach to treatment, stimulating the phrenic nerve to restore a normal breathing pattern.7 This therapy has been demonstrated to improve CSA and QOL. 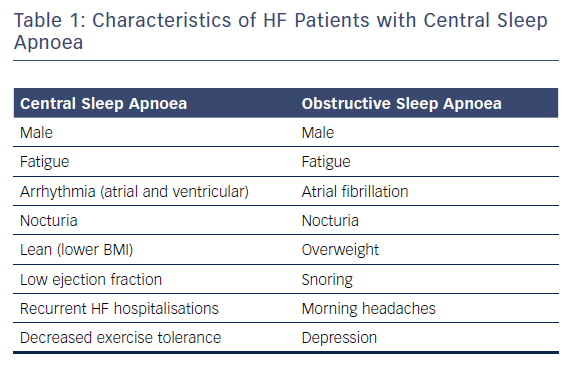 Patients with CSA and HF present with different symptoms from those typically seen in obstructive sleep apnoea (OSA), although some overlap exists (Table 1). HF patients with CSA tend to be thinner, older, have atrial arrhythmias and/or have daytime hypocapnoea (pCO2 <38 mmHg).12 Frequent symptoms include fatigue, insomnia and poor concentration. Patients may also report paroxysmal nocturnal dyspnoea, headache and nocturnal angina, which are thought to be due to intermittent hypoxia.4,12 Both OSA and CSA are more common in men, although it is unclear why this should be the case with CSA.4 Suspicion for sleep apnoeas should be high in the HF population. Regardless of the nature of the apnoea (either OSA or CSA), two-thirds of HF patients have sleep apnoea. CSA occurs in two primary forms, characterised by either Cheyne–Stokes respiration or non-Cheyne–Stokes respiration.17 In HF patients, the Cheyne–Stokes respiratory pattern is much more common and has a characteristic oscillatory pattern of shallow–deep–shallow breathing (Figure 1). Cheyne–Stokes respiration results from a delay in the respiratory control centre in detecting and responding to changes in carbon dioxide levels in the blood. The full mechanism is complex and still not completely understood; however, a number of factors appear to play a role. First, in patients with a reduced ejection fraction, there can be an increase in blood circulation time, which results in a delay in the time it takes blood to reach the carotid body and peripheral chemoreceptors responsible for detecting and signalling changes in blood carbon dioxide levels. Second, sympathetic activation results in increased chemosensitivity in the carotid body, further delaying the signalling. HF patients often hyperventilate chronically, and pulmonary congestion can activate pulmonary stretch receptors to cause a relative increase in ventilation. Elevated respiration can lead to a decrease in carbon dioxide and generate a signal to stop breathing.4 Regardless of which mechanism begins the cycle, each cycle perpetuates the next, allowing the abnormal breathing pattern to continue throughout the night. Each cycle results in repetitive hypoxia and arousal events, leading to long-term detrimental effects. PAP therapies have been tested for the treatment of CSA. The largest randomised controlled trial with the use of continuous PAP (CPAP; single level of air pressure delivered throughout the night) was the Canadian CPAP for Patients with CSA and HF (CANPAP) trial.5 This study randomised 258 patients with HFrEF (ejection fraction <40 %) to CPAP therapy versus no CPAP, with a primary endpoint of morbidity and mortality. Following an interim analysis, a decision was made to stop the study due to an early increase in mortality in the treatment group and a slow enrolment. By the time the study was stopped, there was no difference between the treatment and control groups in morbidity or mortality. The study did demonstrate a reduction in AHI of 21 ± 16 events/hour (from a baseline of 40 ± 17 events/hour).5 However, a post hoc analysis showed that patients who responded to CPAP therapy (defined as achieving an AHI <15) had a decreased mortality rate compared with both CPAP non-responders and controls.22 However, no prospective studies confirming this finding have been completed to date. Following the SERVE-HF Trial, most other research with ASV was stopped. However, the Effect of ASV on Survival and Hospital Admissions in HF (ADVENT-HF) study (ClinicalTrials.gov identifier: NCT01128816), which is examining a type of ASV therapy with an algorithm that should maintain lower pressures, continues. It is enrolling both OSA and CSA patients with a reduced ejection fraction and may give some additional insight into the treatment of CSA. The data and safety monitoring board has reviewed the data several times and has decided to continue the study in both patient groups.29 Another trial, Cardiovascular Outcomes with Minute Ventilation-Targeted ASV Therapy in HF (CAT-HF), enrolled patients acutely hospitalised for HF and placed them on ASV.30 The study used the same device as in SERVE-HF and was stopped early due to the overlap in patient populations once the results of SERVE-HF were reported. However, there were some encouraging data in patients with HF and preserved ejection fraction, although the sample size was very small (n=24). A randomised controlled trial of phrenic nerve stimulation therapy versus no stimulation has been conducted.7 A total of 151 patients with CSA were implanted with the device, with 73 randomised to therapy and 78 to no stimulation. The control group had therapy activated after the primary endpoint evaluation at 6 months. The primary effectiveness endpoint was met, with a 41-percentage-point difference between groups (51 versus 11 %) in the proportion of patients achieving a ≥50 % reduction in AHI from baseline to 6 months. All prespecified and hierarchically tested secondary endpoints were met, including improvements in oxygenation (oxygen desaturation index 4 %), arousals, REM sleep and QOL measured by two different metrics: Epworth Sleepiness Scale and Patient Global Assessment. Safety was closely monitored by independent clinical events committee and a data and safety monitoring board. The primary safety endpoint of freedom from implant-, device- or delivered-therapy-related serious adverse events was achieved in 91 % of patients. Although participants were not required to have HF, 64 % had a history of HF. Owing to the close relationship between HF and CSA, the HF subgroup was carefully studied in light of the results of SERVE-HF. Importantly, no trend of an increase in cardiovascular mortality was seen, although the trial was not powered to evaluate this outcome. Given that phrenic nerve stimulation does not employ PAP therapy to treat CSA, the possible negative effects of PAP therapy noted above should be avoided with phrenic nerve stimulation. Importantly, the FDA approved the use of phrenic nerve stimulation in moderate to severe CSA in adult patients, without regard for the presence of HF or ejection fraction, making phrenic nerve stimulation the only approved treatment in the US for CSA in HF patients with ejection fraction ≤45 %. CSA clearly has chronic and detrimental effects on HF patients. While symptoms may be difficult to identify, there is clear benefit in QOL with treatment of CSA using phrenic nerve stimulation, but this has not been observed with other therapies. It is common for patients not to articulate their symptoms or attribute symptoms of CSA to their HF, which delays diagnosis and treatment of CSA. CSA results in chronic sympathetic nervous system activation and hypoxia. While it is logical that treatment of CSA will be able to decrease the significant morbidity and mortality associated with sleep apnoea, no therapy to date has demonstrated improvements in cardiovascular outcomes. However, this does not mean the disease should not be treated. Improving QOL in HF patients is extremely valuable while we wait for data demonstrating that improvements in sleep apnoea events, oxygenation and arousals lead to improvements in cardiovascular outcomes in this population. Oldenburg O, Lamp B, Faber L, et al. Sleep-disordered breathing in patients with symptomatic heart failure: a contemporary study of prevalence in and characteristics of 700 patients. Eur J Heart Fail 2007;9:251–7. Khayat R, Abraham W, Patt B, et al. Central sleep apnea is a predictor of cardiac readmission in hospitalized patients with systolic heart failure. J Card Fail 2012;18:534–40. Khayat R, Jarjoura D, Porter K, et al. Sleep disordered breathing and post-discharge mortality in patients with acute heart failure. Eur Heart J 2015;36:1463–9. Costanzo MR, Khayat R, Ponikowski P, et al. Mechanisms and clinical consequences of untreated central sleep apnea in heart failure. J Am Coll Cardiol 2015;65:72–84. Bradley TD, Logan AG, Kimoff RJ, et al. CANPAP Investigators. Continuous positive airway pressure for central sleep apnea and heart failure. N Engl J Med 2005;353:2025–33. Cowie MR, Woehrle H, Wegscheider K, et al. Adaptive servo-ventilation for central sleep apnea in systolic heart failure. N Engl J Med 2015;373:1095–105. Costanzo MR, Ponikowski P, Javaheri S, et al. Remede¯ System Pivotal Trial Study Group. Transvenous neurostimulation for central sleep apnoea: a randomised controlled trial. Lancet 2016;388:974–82. Javaheri S. Sleep disorders in systolic heart failure: a prospective study of 100 male patients. The final report. Int J Cardiol 2006;106:21–8. Grimm W, Apelt S, Timmesfeld N, Koehler U. Sleep-disordered breathing in patients with implantable cardioverter-defibrillator. Europace 2013;15:515–22. Bitter T, Faber L, Hering D, et al. Sleep-disordered breathing in heart failure with normal left ventricular ejection fraction. Eur J Heart Fail 2009;11:602–8. Bitter T, Langer C, Vogt J, et al. Sleep-disordered breathing in patients with atrial fibrillation and normal systolic left ventricular function. Dtsch Arztebl Int 2009;106:164–70. Bekfani T, Abraham WT. Current and future developments in the field of central sleep apnoea. Europace 2016;18:1123–34. Hastings PC, Vazir A, O’Driscoll DM, et al. Symptom burden of sleep-disordered breathing in mild-to-moderate congestive heart failure patients. Eur Respir J 2006;27:748–55. Redeker NS, Muench U, Zucker MJ, et al. Sleep disordered breathing, daytime symptoms, and functional performance in stable heart failure. Sleep 2010;33:551–60. Javaheri S. Heart Failure. In: Kushida C (ed) The Encyclopedia of Sleep, vol. 3. Waltham, MA: Academic Press, 2013; 374–86. Taranto Montemurro L, Floras JS, Millar PJ, et al. Inverse relationship of subjective daytime sleepiness to sympathetic activity in patients with heart failure and obstructive sleep apnea. Chest 2012;142:1222–8. 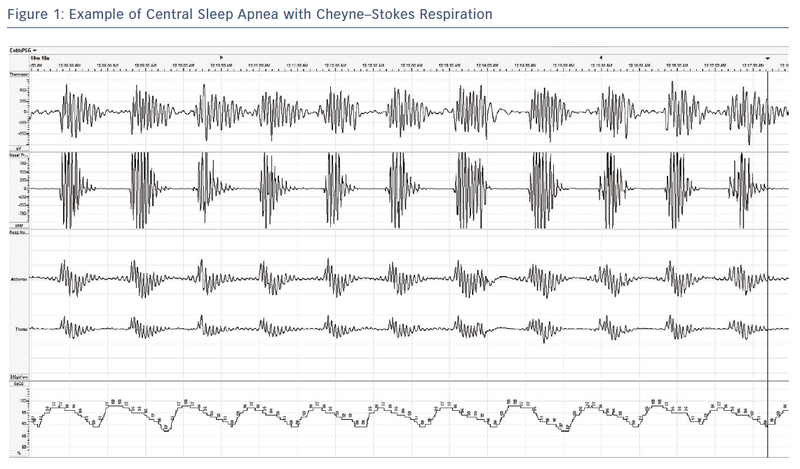 Flinta I, Ponikowski P. Relationship between central sleep apnea and Cheyne–Stokes respiration. Int J Cardiol 2016;206(Suppl):S8–12. Campbell AJ, Ferrier K, Neill AM. Effect of oxygen versus adaptive pressure support servo-ventilation in patients with central sleep apnoea–Cheyne Stokes respiration and congestive heart failure. Intern Med J 2012;42:1130–6. Sasayama S, Izumi T, Matsuzaki M, et al. Improvement of quality of life with nocturnal oxygen therapy in heart failure patients with central sleep apnea. Circ J 2009;73:1255–62. Sepehrvand N, Ezekowitz JA. Oxygen therapy in patients with acute heart failure: friend or foe? JACC Heart Fail 2016;4:783–90. Liu D, Armitstead J, Benjafield A, et al. Trajectories of emergent central sleep apnea during CPAP therapy. Chest 2017;152:751–60. Arzt M, Floras JS, Logan AG, et al. CANPAP Investigators. Suppression of central sleep apnea by continuous positive airway pressure and transplant-free survival in heart failure: a post hoc analysis of the Canadian Continuous Positive Airway Pressure for Patients with Central Sleep Apnea and Heart Failure Trial (CANPAP). Circulation 2007;115:3173–80. Aurora RN, Bista SR, Casey KR, et al. Updated adaptive servo-ventilation recommendations for the 2012 AASM guideline: “the treatment of central sleep apnea syndromes in adults: practice parameters with an evidence-based literature review and meta-analyses”. J Clin Sleep Med 2016;12:757–61. Eulenburg C, Wegscheider K, Woehrle H, et al. Mechanisms underlying increased mortality risk in patients with heart failure and reduced ejection fraction randomly assigned to adaptive servoventilation in the SERVE-HF study: results of a secondary multistate modelling analysis. Lancet Respir Med 2016;4:873–81. Oldenburg O, Coats A. CSA is not beneficial long term in heart failure patients with reduced ejection fraction. Int J Cardiol 2017;227:474–7. Javaheri S, Brown LK, Randerath W, Khayat R. SERVE-HF: more questions than answers. Chest 2016;149:900–4. Woehrle H, Cowie MR, Eulenburg C, et al. Adaptive servo ventilation for central sleep apnoea in heart failure: SERVE-HF on-treatment analysis. Eur Respir J 2017;50:1601692. Yamauchi M, Combs D, Parthasarathy S. Adaptive servo-ventilation for central sleep apnea in heart failure. N Engl J Med 2016;374:689. Lyons OD, Floras JS, Logan AG, et al. ADVENT-HF Investigators. Design of the Effect of Adaptive Servo-Ventilation on Survival and Cardiovascular Hospital Admissions in Patients with Heart Failure and Sleep Apnoea: the ADVENT-HF trial. Eur J Heart Fail 2017;19:579–87. O’Connor CM, Whellan DJ, Fiuzat M, et al. Cardiovascular outcomes with minute ventilation-targeted adaptive servo-ventilation therapy in heart failure: The CAT-HF Trial. J Am Coll Cardiol 2017;69:1577–87. Costanzo MR, Augostini R, Goldberg LR, et al. Design of the remede¯ System Pivotal Trial: a prospective, randomized study in the use of respiratory rhythm management to treat central sleep apnea. J Card Fail 2015;21:892–902.